For renters, the West End is so close to downtown Vancouver jobs that you can ditch your vehicle and save enough money to cover the extra rent costs. But if someone wants to buy in the West End, and that someone has two or more children, what then? There’s not much available at any price, other than small condo apartments in towers. From this point of view, it’s fair to say that West End Vancouver ranks low on the livability scale for some potential residents. There are townhomes and low-rise options in Kitsilano across the bridge, but the purchase costs are very high. 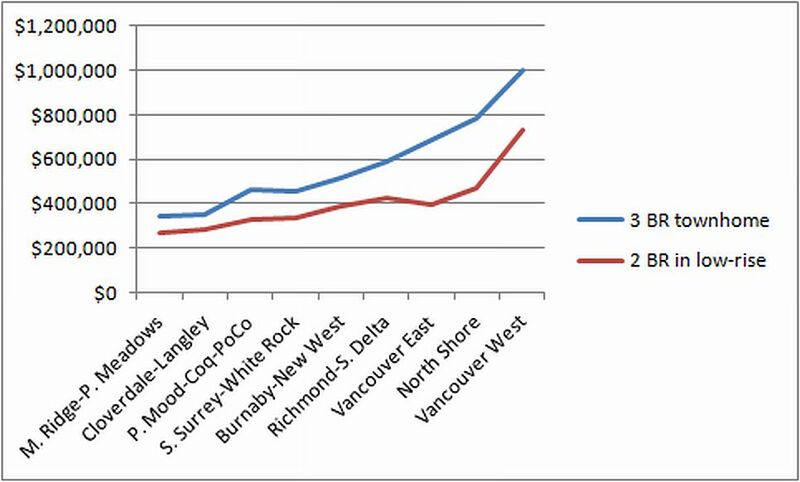 The dramatic differences in real estate prices across Metro Vancouver are widely but maybe not universally known. News reports in the national media blur the distinction between the City of Vancouver and Metro Vancouver; people in Calgary can be forgiven for thinking that every small bungalow in “Vancouver” will cost a million bucks or more, with one-bedroom condos starting at half a million. In fact, it’s cheaper in the suburbs, and three quarters of Metro Vancouver’s population lives in the suburbs. At the low end, Quattro in the new Surrey Central complex posts starter condos at $199,900; a development called 223 North near the Maple Ridge town centre advertises them at $139,000, and the developer will cover property tax payments for three years. Collier’s, a real estate firm, has released a survey of apartment and townhome sale prices in Metro Vancouver during the first quarter of 2012. As close to the City as Burnaby-New Westminster, three-bedroom townhomes cost half as much as those in Vancouver West (Kitsilano, Point Grey.) The price break in suburbs to the east is even greater. Other surveys over time have shown that the same pattern applies to detached homes. This blog often focuses on densification and walkability; the urban villages I’ve promoting tend to serve couples and seniors. Even in low-cost suburbs, it’s not always easy for a family with kids to find appropriate housing close to the high street. But the West End is an extreme example of a place that’s difficult for families to locate; with its lack of ground-oriented housing for sale, and high prices for the rest, I have reduced the West End’s livability score (slightly) in response to a reader’s comment. However, it needs to be said that the City of Vancouver is a better place to invest if you can afford it; in the suburbs, the value trend for townhomes and apartments in particular is generally down. I like the angle of the shot with mural in the foreground – Maple Ridge needs more, much more of this. Over the years I have often referred (in jest of course) to Maple Ridge as ‘The Village of Mape”. With the current – and long awaited – explosion of development in our ‘village’ drive largely by a population moving steadily eastwards in search of affordable digs and assisted greatly by a slew of tax breaks for developers and renovators alike, it is little wonder that ‘the village of Mape’ is becoming a reality. Savvy retailers and restaurant entrepreneurs can sense that notwithstanding the ongoing battles between a recalcitrant and dull administration, opportunities do in fact exist here on the fringes of Metro Vancouver. Thanks, Claus. I agree with your suggestion that it takes only a few innovations, a few “new faces,” to generate interest in an urban village. 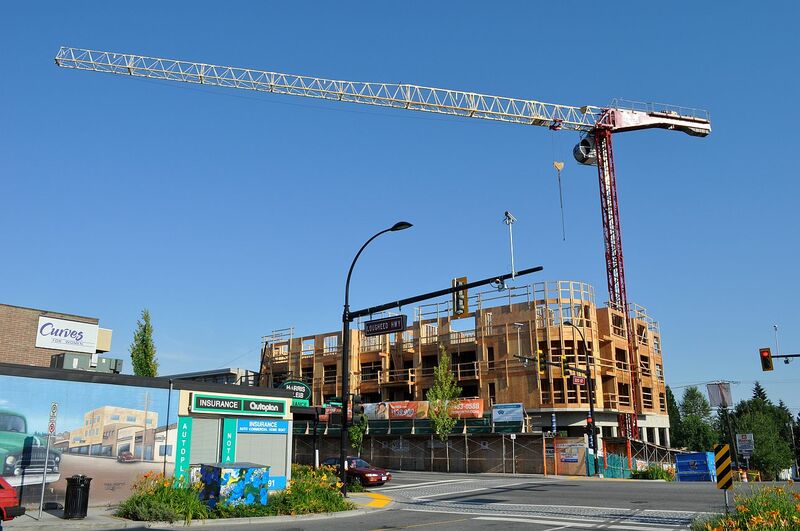 The single California/Kitsilano building front on Hastings Street in Burnaby Heights (May 15 post), while highly derivative, may attract new businesses and residents who are looking for coolness, and ultimately create the basis for a new city. For mature villages like the West End and Commercial Drive, the challenge is the opposite — they have to arrest the takeover of exotic retail and restaurants, and hang on to their more basic services. But I think it will be a while before we face this problem in Maple Ridge.